They’ve scurried around wharves and warehouses for decades. They’re small and not much to look at, but they can lift a 1000 lbs load over 40 ft in the air with ease. When the going gets tough the forklift is there to ease the burden. The forklift has been doing the heavy lifting for a hundred years, but where did it come from and how has it evolved? 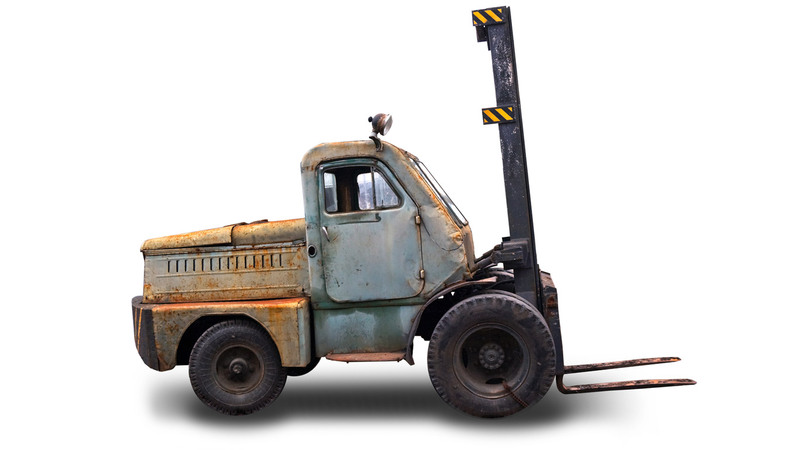 Originally forklifts were manually powered hoists that were used to lift loads. These initial prototypes would serve as the starting point of an evolution to the sophisticated machines you see today. The forklift has come a long way and looks like recent technological developments will ensure it continues to roam docks and warehouses… but in a new and improved form. According to Toyota, these original units were wrought-iron axles and cast iron wheels which enabled loads to be lifted and transported horizontally without manual labor. In the early 1900’s this horizontal and vertical motion resulted in the first crude forklift capable of lifting many items a few inches off the ground. 1906 – The Pennsylvania Railroad introduced battery powered platform trucks for moving luggage at a train station in Altoona, Pennsylvania. This concept would later drive the introduction of the modern electric forklift. World War I Era – The war caused a massive labor shortage which drove the development of the early forklift. Across the globe, forklifts were designed, calibrated and revamped to meet the demands forged by the war. In the UK, several different types of material handling equipment were developed by Ransomes, Sims & Jefferies of Ipswich. In 1917 Clark, a US company still thriving today that has cemented itself as an industry leader, began developing and using powered tractor and powered lift tractors in their factories. Roaring 20’s – In 1923 the first electric truck was introduced, created by Yale, and incorporating a vertical mast and raising forks. This is regarded by many as the first proper model of the traditional forklift truck that we recognize today. According to H&F Lift Trucks, Yale used a ratchet and pinion system for the lifting mechanism which allowed the mast to be elevated above the height of the truck. World War II – The Second World War once again drove rapid advancements and remodeling of the forklift and other material handling appliances to handle the high volume and demands of the military. 1950’s and 1960’s – Forklift manufacturers became more safety-conscious. They began introducing new features and mechanisms designed to protect forklift operators and reduce the risk of accidents in the workplace. The forklift also evolved to meet changing needs. The narrow aisle forklift was introduced to navigate emerging distribution centers with lots of inventory and limited space. 1980’s – Forklifts were tailored to meet ergonomic demands and to bolster productivity and efficiency. In addition, forklifts were also constructed for comfort and ease of operation ultimately reducing injuries in the workplace. Forklifts Today – Forklifts are no longer simply gas-fed lift trucks. Today forklifts are also available as electric powered or hybrids. The four basic types of forklift are designed for specific tasks: Internal Combustion Cushion Tire Forklifts, Internal Combustion Pneumatic Tire Forklifts, Pallet Jacks or Electric Forklifts. Today, a high capacity forklift truck can lift a staggering 100,000lbs. (the Hyster H800-1050HD/S). A high reach forklift can raise a 1000lbs load over 40 feet in the air. What can we expect from the forklift of the future? Manufacturers are already looking at alternative power sources like hydrogen fuel cell technology which will cut fuel costs and reduce downtime. Current tech trends suggest that we can look out for connected forklifts, incorporating sensors, cameras and the Internet of Things (IoT). IoT offers huge potential in the area of fleet management and for wider integration into the Digital Supply Chain. Heads Up Displays (HUD) and augmented reality (AR) are in the works. These will provide drivers with more information and better awareness of their environment. Doosan Industrial Vehicle UK won a Red Dot design award for their Intelligent Concept Forklift which has cameras on the forks and mast to provide better visibility to the driver in the cockpit. One big question is: Will forklifts have a driver in future? Driverless cranes are already move containers at the Port of Los Angeles. Yale has developed the robotic lift truck and picking robots such as Kiva (and other emerging players) are a reality today. It seems inevitable. The “workhorse of the warehouse” will likely become autonomous even more valuable. A version of this article was first published on the National Forklift Exchange.